One of the many places that we can find surnames of interest, is in the wording of printed advertising and business stationery. The first of these tends to have a better survival rate as the magazines and newspapers in which they appear may be preserved for historical interest and for the articles they contain. There is a very active market in old pages from newspapers, and they are often found framed and used as decoration, particularly in public houses where there is a historical theme. We have acquired a number of such items, including the page about Lily Lindfield, the dancer, described later in this issue. Business letterheads are somewhat less likely to have survived. Whilst people may retain receipts and invoices for major purchases and for building works on their house, for example, such papers are often disposed of after a few years and if they are retained are typically disposed of by the executors following the death of the owner. One of the many useful aspects of the Internet is that paper material of historical interest can now be offered for sale to a world-wide audience, who have the facility to search for items using a surname or other words of interest. We have standing searches in place on sites such as Ebay, which send me a message whenever the Linfield name or any of the variant spellings appears in an item for sale. By this means, we have acquired a number of items of interest, and some examples are shown below. 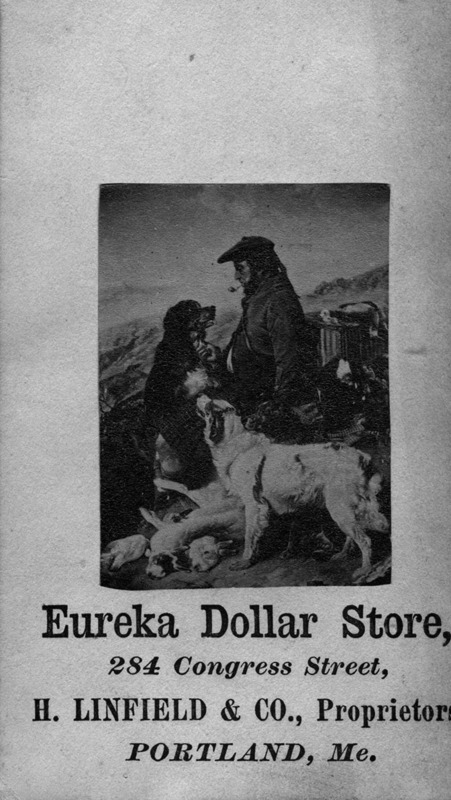 The first is an advertising card from the Eureka Dollar Store, which evidently traded from Congress Street, Maine in the United States. The proprietor appears to be one H Linfield. Sadly, we cannot readily tell when it was printed, and further research is needed to establish which of many possible H Linfield’s this was. 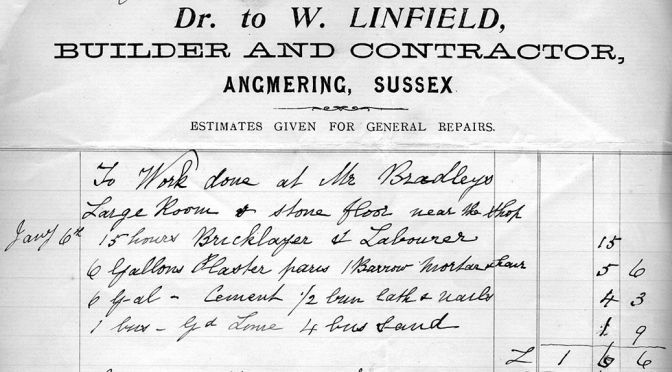 The second example is from closer to home and relates to the Angmering families. 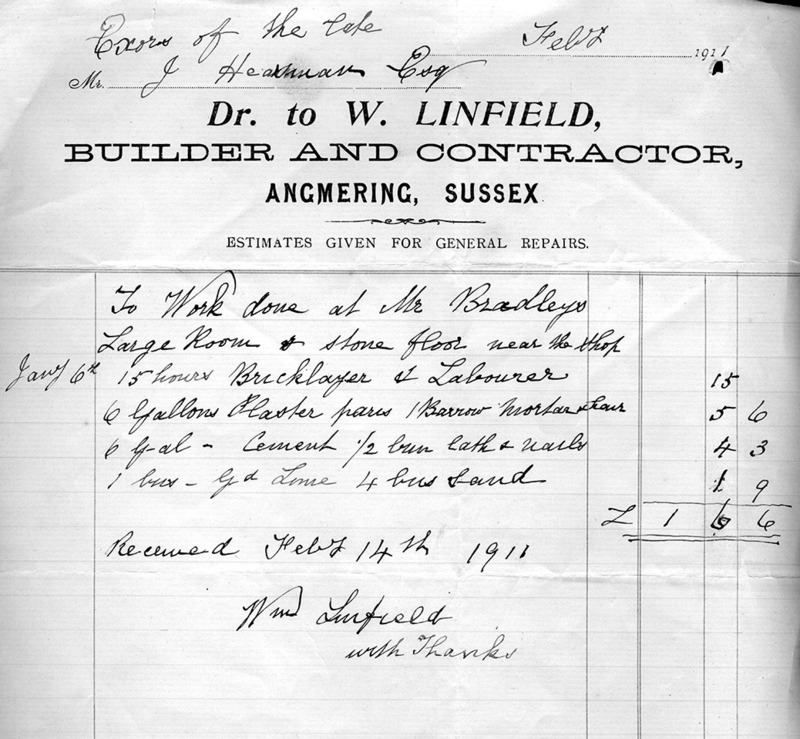 William Linfield traded as a builder for many years in Angmering and we have fairly comprehensive information about this branch of the Linfield family. It is worth mentioning that this document has a hand written annotation in the top margin, showing that it was one of the papers dealt with by the executors of the customer, whose name is difficult to read but was possibly J Heasman or something similar. The invoice may owe its survival to having found its way into a pack of legal papers during the probate of the deceased customer, presumably because it was unpaid at the time of his death. It would perhaps be a good idea for us to collect copies of the current or past letterheads and advertising material of people who trade with the Linfield and similar names, so that these too can be preserved for future generations of surname researchers. If any reader has such material, I would be very grateful for a copy.